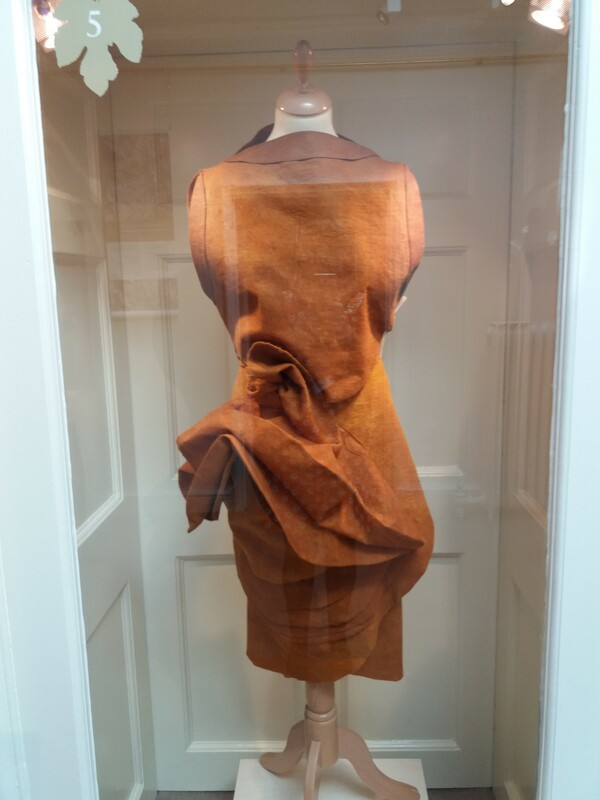 As the world of fashion begins to take note of environmental issues and sustainability, Killerton House’s fashion exhibition for 2019 could not be more topical. Forming part of the National Trust’s commemoration of 100 years of the Forestry Commission, ‘Tree of Life’ explores the ancient relationship between trees and people and the historic and ongoing use of trees as a raw material for clothes and shoes and as an inspiration for textile and dress design. The exhibition is based around the tree of life motif that was spread across the Western world though Indian textiles and each upstairs room of the fashion exhibition focuses on patterns inspired by a different part of a tree. ‘Tree of Life’ starts by looking at examples of designs drawn from nature and features a dress made of Barkcloth by the Ugandan-born British designer José Hendo. Hendo promotes the use of organic and recycled materials in her designs and favours Barkcloth, which is made from the inner bark of the mutuba tree, as ‘it is a perfect ambassador for sustainability because its harvesting does not destroy the tree which can still be harvested for many years’. 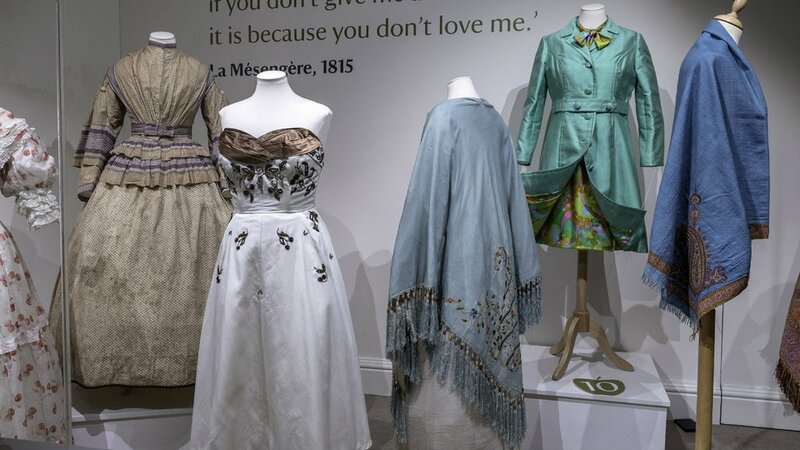 The exhibition then continues by displaying designs that are drawn from the 18th century to the 1950s. Naturalistic patterns, such as those incorporating leaf motifs, have been fashionable since the 1740s, when they could be found on woven silk waistcoats. Innovations in textile manufacture, especially printing, allowed designers to produce novelty fabrics with printed cotton 1950s dresses on display show a more abstract variant on the leaf theme. The creation of the first artificial fibre, artificial silk, is also highlighted in the Efford case as manufacturers began to use plants and trees to create new fabrics. By the 1920s processed cellulose, marketed as rayon, had revolutionised the fashion industry. One of the most special items on display is the M.P. Francis Acland’s Privy Councillor uniform from 1915. Acland, whose son Richard gifted the Killerton estate to the National Trust in 1944, was influential in setting up the Forestry Commission and served as a commissioner until his death in 1939. The Privy Councillor’s uniform consists of a wool cloth and velvet suit which would have been worn with a white collar, boots and a ceremonial sword. The gold embroidery on the collar and cuffs of the jacket depicts an oak leaf and acorn - the amount added depended on the wearer’s status. On display in Landkey, is The Tree of Life Project which is the result of a collaboration between Killerton’s costume department and Exeter School of Art and Exeter College. 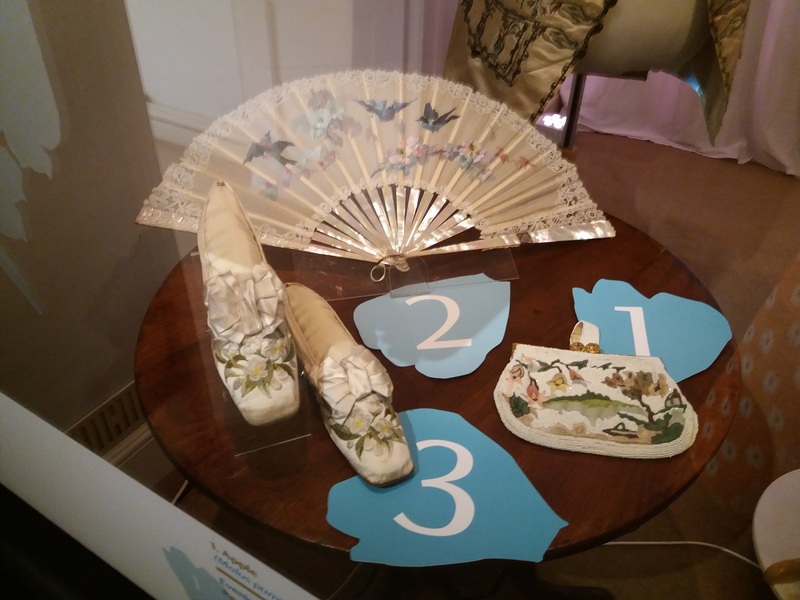 Staff and students took part in the project during the 2018 autumn term as part of their assessed coursework and were invited to Killerton to see the fashion collections in store and to explore the park, house and garden with National Trust rangers, gardeners and curators. The student brief included basing inspiration for their designs on objects selected for the display as well as exotic trees in the garden, the orchards and the wooded landscape at Killerton. They explored the impact of trees on the environment, while also considering ecological impacts and sustainability for the future. The exhibition moves onto flowers and blossom in Landkey dressing room. Blossoms and petals were used in all aspects of design as they symbolised hope, which linked back to ancient Persian flowering tree patterns. During the 18th century silk designs changed with the seasons, just as fashionable prints came and went in the 19th and 20th centuries. On show are a pair of bridal shoes dating from the 1870s-80s, hand embroidered with orange blossom (a symbol of good luck and fertility) in cotton thread. A large illustration by Teresa Whitfield dominates Trerice. Whitfield makes intricate ink drawings of historical lace from museum collections across the UK including the Royal Albert Memorial Museum Exeter, the Victoria & Albert Museum London, and Bath Fashion Museum. Her work explores the demise of the hand-made lace industry and challenges preconceived ideas about lace. 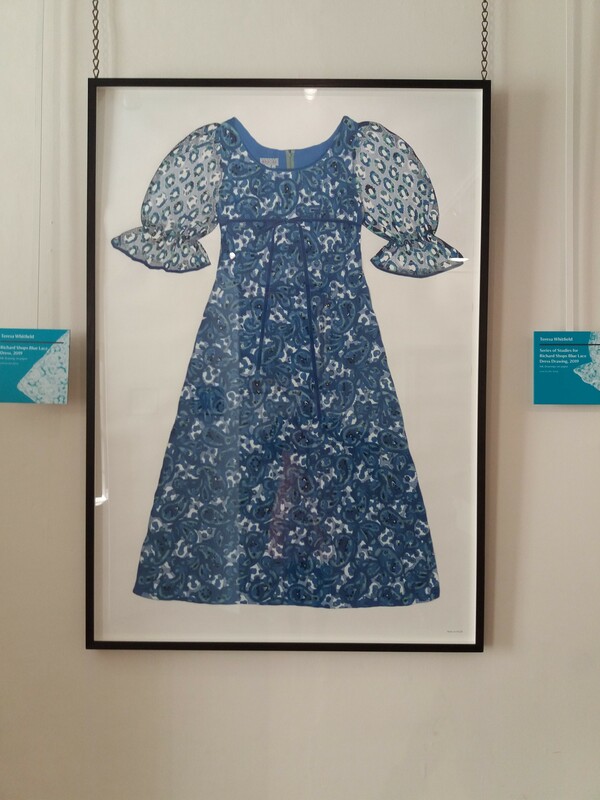 Teresa Whitfield drew a 1970s lace dress from Killerton’s costume collection especially for the exhibition and the process is shown in smaller illustrations displayed around the room with the dress. Fruits, seeds and nuts have frequently provided inspiration for designers and one of the most famous and successful patterns is ‘Paisley’. The pattern is based on the 'buta' or 'boteh' that represents a seed, fruit or flower, symbolising fertility, and is usually combined with a stylised floral spray and a cypress tree (an ancient Persian symbol of life and eternity) in a stylised form. Examples of the pattern displayed include a waistcoat and shawls that were made by manufacturers in Paisley in Renfrewshire, Scotland. The final display case features objects made of wood, including clogs, shoe tress and needlework containers and re-introduces the tree of life motif with embroidered textiles. Wooden soled footwear is made and worn by men, women and children in many parts of the world . Clogs have been worn for practical, therapeutic and fashionable reasons and the sycamore sourced from north Devon has supplied clogmakers nationwide. On display are a pair of late 20th century Jack Crawshaw clogs worn by a Lancashire clog dancer, who was a member of the Mossley Women’s Morris group. The 2019 exhibition highlights how all parts of the tree, from root to branch, have been used to make clothing and accessories over the centuries and what is being done now to make fashion more sustainable. 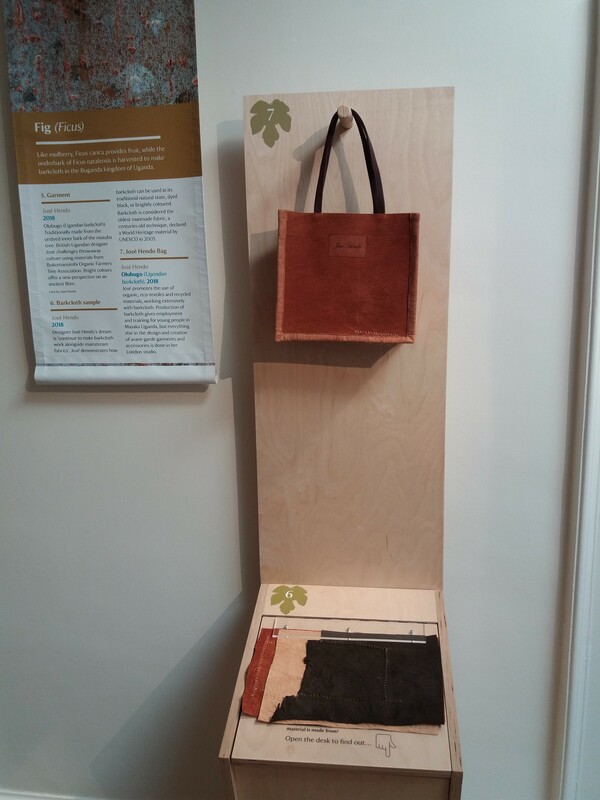 New for this year, the exhibition also allows visitors the chance to handle samples and contemporary designed objects made from raw materials from five trees that can be found on the Killerton estate. Entry to the ‘Tree of Life’ exhibition is included in admission to the Killerton estate. The exhibition is open until the 3rd November 2019.
there will be a chance to meet designer José Hendo and artist Teresa Whitfiled at one of the monthly Meet the Curator behind the scenes events later in the year.